The Omni Group’s venerable OmniGraffle Pro diagramming tool has been the standout program of its kind for years. The new version 6 continues that tradition with a modernized engine to enjoy and some interface changes to, well, get used to. 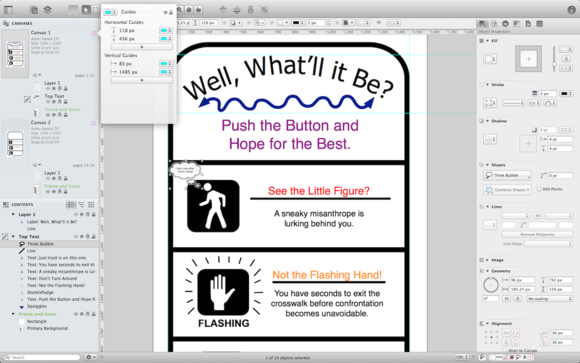 At its heart, OmniGraffle Pro is for creating diagrams. Flowcharts, organization charts, software wireframes, space planning, and entity relationship diagrams are some of the classic uses. OmniGraffle Pro’s new Resource Browser offers various templates and shape collections called Stencils for creating these documents. If, say, you’re working on a new floor plan for an office, you can choose from the Resource Browser a space-planning template where 1 inch equals 1 foot. Then in the template you can drag and drop walls, doors, and furniture objects from the space planning stencils. One of OmniGraffle Pro’s sleeper features is the ability to store metadata about any given object. Despite the “complete user interface redesign” touted by The Omni Group, using version 6 is not dramatically different from OmniGraffle Pro’s previous incarnation. All of the tools and controls have been redrawn with an eye to making their functions easily understood at a glance. In doing so, they’ve made a nod to the flat design aesthetic recently embraced by Apple for iOS 7. Those who aren’t fans of flat design needn’t fret—the effect is a subtle improvement, not a jarring change. The various object inspectors and drawing and layer tools behave as they did in the past. That’s definitely a good thing as we’ve previously lauded OmniGraffle Pro’s usability in these pages. One significant change is that the Object Inspector and Stencil Palette are now incorporated into the document window as a column down the right side. Both were previously presented as independent floating palettes. The decision to scrap the floating palettes likely has to do with OmniGraffle Pro’s improved support for high-density displays Apple calls Retina. To be sure, OmniGraffle Pro 6 looked great on every display I tried, but my preferred two-screen setup with the document on the main display and palettes on the second is no longer an option. A refreshed user interface and full support for Retina displays help OmniGraffle Pro 6 stay as useful as ever. Some welcome additions to the OmniGraffle Pro toolbox have been introduced. Controls for combining multiple shapes make it possible to join or intersect any number of objects on a layer, alleviating the need to switch to image editing software for basic mask effects. Because combinations are reversible, you can revert back to independent shapes at will. Text running along a line can now follow curved paths, adding some refinement to complex diagrams. The Omni Group has added a few features to facilitate consistency among the canvases in a given document. Complimenting traditional guides that can be dragged out of a ruler are Manual Guides. Invoked from the Canvas settings, Manual Guides can be specified with custom colors, optionally locked in place, and dragged to other canvases in your document. Layer sharing places the selected layer in every canvas of the current document, akin to a master slide in a presentation program. Taken together, both of these features can help attain consistency when producing several iterations of a diagram. Presentation mode offers a simple way to present diagrams to others. When invoked OmniGraffle Pro enters a full screen mode that hides all tools and inspectors and shrinks the diagram to fit on screen if necessary. Each canvas is treated as a slide and mouse clicks or arrow keys are used to navigate among them. Canvases in presentation mode needn’t be static; selecting the properties tab in the insepctor opens up the ability to assign various actions to the objects on the canvas. Actions include navigating within the presentation, zooming in on a particular portion of the canvas, opening documents or URLs, even triggering an AppleScript. Presentation mode isn’t designed to supplant products like Keynote, it does provide a clean way to share your diagrams with a live audience. One of OmniGraffle Pro’s sleeper features is the ability to store metadata about any given object. In the properties inspector, the note section has fields for the object name and freeform notes. Just below that is a table for entering name/value pairs of data describing quantifiable things such as height, weight, or color. The power behind these seemingly mundane bits of metadata comes from OmniGraffle Pro’s ability to use your input as tool-tips when the cursor hovers over an object. The information entered here is also indexed by Spotlight, providing a way to search for OmniGraffle documents based on the notes, even if that information doesn’t appear in the body of the diagram. The documentation accessible from the Help menu is hampered by the inability to search its contents or even navigate among articles without a trip back to the table of contents. A bit of hunting on Omni Group’s website netted the same information in searchable PDF form. Given the limitations of the built-in documentation, a download link to that PDF, or at least a mention of its existence, would have been most welcome. OmniGraffle Pro 6 is still the best and easiest way to produce neat and professional-looking diagrams. Upgrading users may need a little time to get used to the interface revisions, but the new shape and canvas tools offset any inconvenience.